Origin and Habitat: General Escobedo, Durango, Mexico. Habitat: It grows among volcanic rocks in semi desert together with Opuntia durangensis. 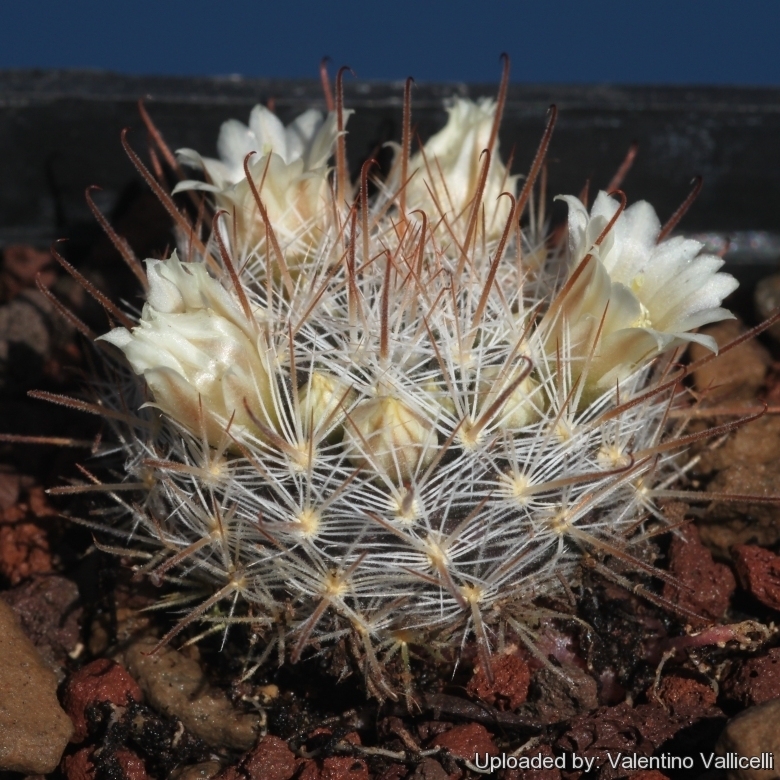 Description: Mammillaria brachytrichion is a tiny species with feathery hooked spines, solitary or forming clusters. Stem: Spherical depressed to somewhat elongate with age, dark green, 1-2 cm tall, 1,5-4 cm in diameter, but often larger in cultivation. Without latex. Axil: Without bristles or wool. Radial spines: 26-32, about 7-10 mm long, pubescens, needle-like, stiff, straight, translucent whitish to yellowish brown, with dark tips. Central spine: Somewhat feathered, 7 to 11, fine, needle-like, reddish brown with yellowish base, to 6 mm long, of which one sometimes hooked, others straight. Flower: Funnelform, white, sometimes with pink midveins, 10-12 mm long, 12-14 mm in diameter. Fruit: Small, greysh-green or pinkish. 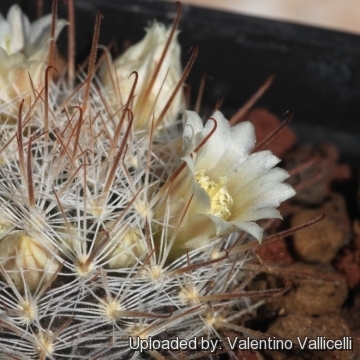 Mammillaria pennispinosa Krainz: has creamy-white to orange-pink plumose (feathery) radial spines and brown hooked centrals. Distribution: northwest of Gómez Palacio, Durango, Mexico. 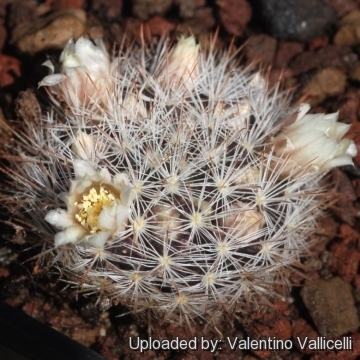 Mammillaria pennispinosa subs. brachytrichion (Lüthy) U.Guzmán: is a tiny species with feathery hooked spines. Distribution: General Escobedo, Durango, Mexico. 5) Fitz Maurice, W.A. & Fitz Maurice, B 2013. 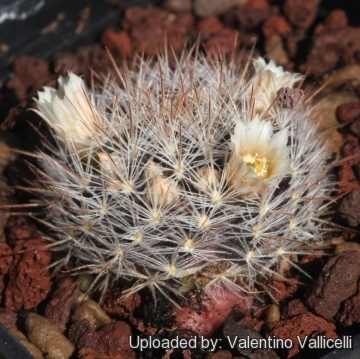 Mammillaria pennispinosa. In: IUCN 2013. "IUCN Red List of Threatened Species." Version 2013.2. <www.iucnredlist.org>. Downloaded on 19 February 2014. Cultivation and Propagation: Requires excellent drainage provided by porous cactus soil (With not less than 50% grit content). We suggest repotting every 2-3 years. Prefers bright light and ample airflow. Outside full sun or afternoon shade, inside it needs bright light, and some direct sun. Water should be carefully applied and only when the soil is dry to the touch, as fits this cliff-dwelling species. Allow soil to drain thoroughly before watering again. Do not water in the winter (Rot prone). Protect from frost. But it's hardy to -5°C if kept dry. During the beautiful season enrich the soil using a fertilizer rich in potassium and phosphorous, but poor in nitrogen, because this chemical element doesn’t help the development of succulent plants, making them too soft and full of water. This rarely found species is slow growing, but rewards the patient grower with displays of small dark pink flowers. Winter rest is important to stimulate flowering. Use small sized pots. Propagation: Direct sow after last frost or cuttings.